Daniel Goodman's folk-rock-blues troubadour stylings owe a significant debt to Bob Dylan, Lou Reed and Nick Drake; more often than not, the emphasis is on the vocals rather than the music. 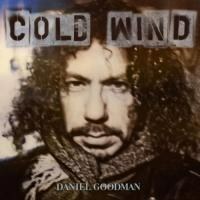 Sometimes this works well, as on the stellar opening track "When the Cold Wind Blows", which combines Goodman's wry observations with a bluesy shuffle. "The Theater of Optimism" tries for the same effect, with somewhat less successful results. Other good songs include energetic workouts "The Shadow of the Sun" and "The Dark Side of Love". The album's back half loses momentum, though, with fairly dull tracks like "Such a Fine Day" and "The Golden Road" swapping out lyrical and musical oomph for a surfeit of acoustic guitar strumming. Cold Wind is a promising album, but in some instances the promise remains unfulfilled.